Closet-laundry room conversion is a monumental job because it’s one that does require a whole lot of specialized skills. You’ll need the chops of a carpenter, a plumber, and an electrician. Not to mention the craftiness of a professional organizer. This is due to the fact that it’s a complex job. Although, it is a simple idea, the execution is quite difficult. All of this, not to mention the fact that you’re giving up a dedicated storage space. 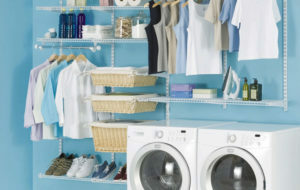 However, a closet-laundry room conversion can easily be worthwhile. Measure the space. The first step is to determine if the space is enough to accommodate your washer and dryer. (If it’s not, the project just got a lot more complicated because it will require more build-out.) If there is sufficient space, you can easily proceed. Install floor protection. You’ll need to install a floor protection system to prevent any water damage in the case a leak occurs. These are readily available but are absolutely necessary to avoid potential damage. Route water and drain lines. Next, you’ll need to add water supply and drain lines. This is where things get difficult and quite costly. Leave this to an experienced and licensed contractor so it’s done right. When you’re done, phone 800-433-1094 or visit Junk Garbage Removal for remodeling debris disposal.